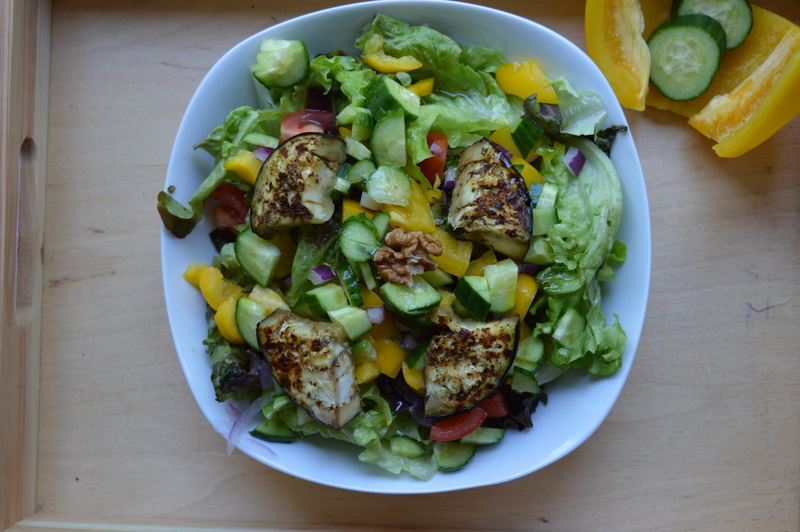 I don´t know about you, but I love salads. Anytime, anywhere, give me a salad and I´m happy. Especially in summer when it´s all hot then a salad is the only thing I want. So since I eat so many salads I am always trying new things and experimenting around. You´ll never get the exact same salad at my place. So here I put together a few of my favorites. Hope you enjoy! If you did, let me know and I´m sure to do another post on some more salads! And leave me a comment what you´d like me to write about! One of my favorites! Wash your lettuce, chop up your desired veggies and throw them on a plate. In a pan heat up some oil, cut the eggplants in slices and sauté them until they start to get a bit soggy, take them out, cut them if you wish and add them to your salad. 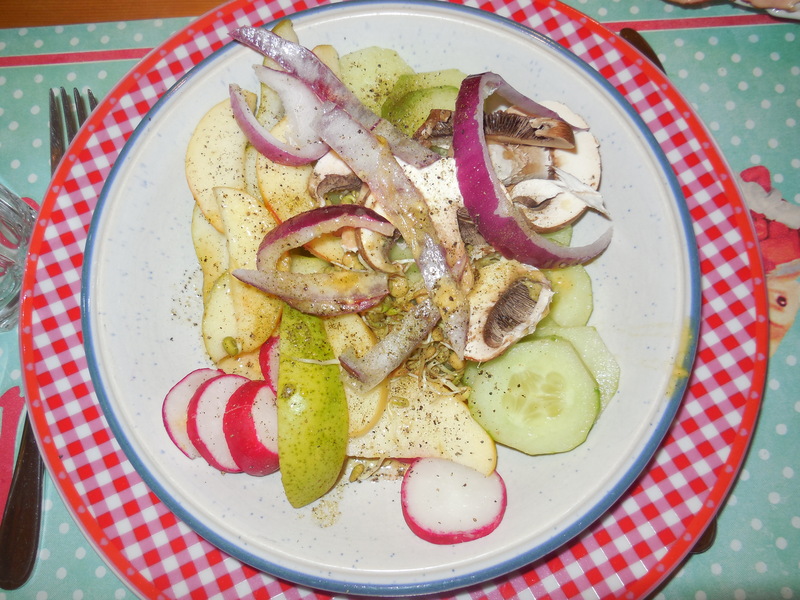 For the dressing I chose the classic vinegar and olive oil. Just cut up everything, throw on a plate and add olive oil and apple vinegar. Done! It´s so delicious! The parmesan is missing in this picture, I decided to add it afterwards, because it tasted better and rounds off everything. Feel free to leave it out if you´re vegan. 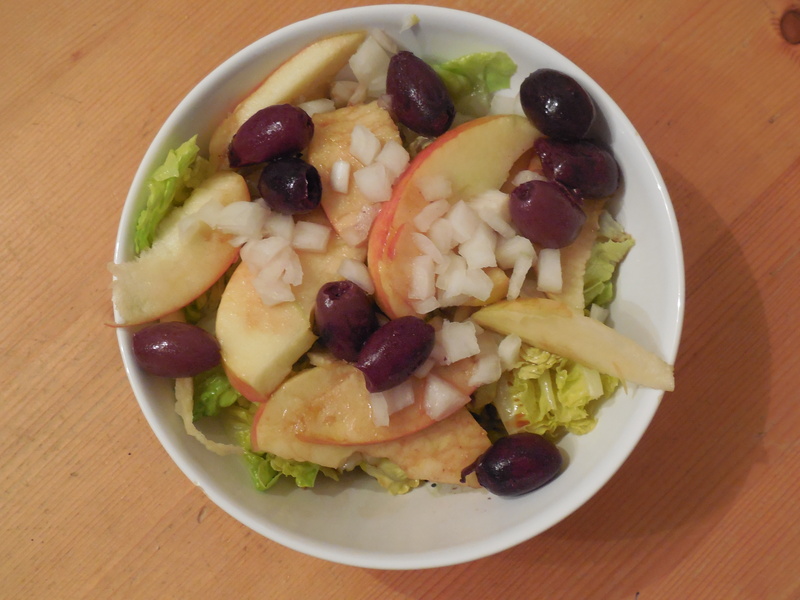 Wash and cut up your lettuce, and apple, add them to a bowl. If your olives are pickled and seedless, just toss them in the bowl as well. Cut up your onion and add that along with the parmesan cheese (cut up the way you like it, I like it in tiny slices the best). For the dressing I chose balsamic vinegar and olive oil. Enjoy!